While B M Hedge was speaking, a group of research scholars at IIT-Madras held placards saying 'RIP Science' and 'Saathi of Quacks'. A section of IIT-Madras research scholars, who call themselves 'IITM Students against Pseudo-Science', on Tuesday held placards against Padma Bhushan awardee and cardiologist B M Hegde during a lecture on the campus, calling him a proponent of "pseudo-science and quackery." Belle Monappa Hegde, who had won the third highest civilian award in 2010, was invited by one of the student bodies of the institute, 'Saathi', who also has a faculty advisor Dr Vijaylakshmi, Management Studies Department, to lecture on the topic 'Matters that Matter'. 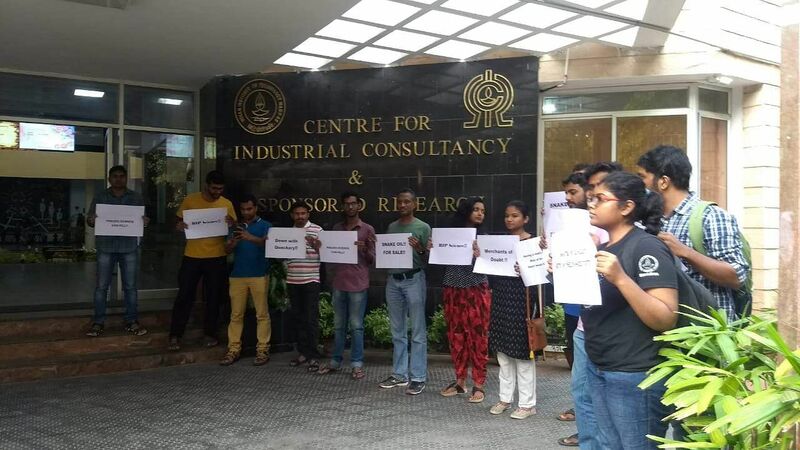 While he was speaking, the group of research scholars of the institute held placards saying 'RIP Science' and 'Saathi of Quacks' in spite of the attempt by the institute security to curb the protest. Is this just a lapse in checking the background of the speaker? 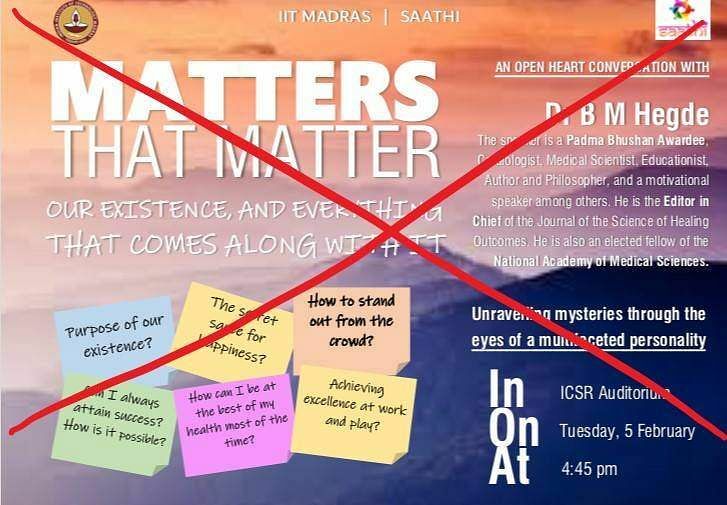 Or is the team Saathi and IIT Madras, an accomplice in propagating pseudo-science? 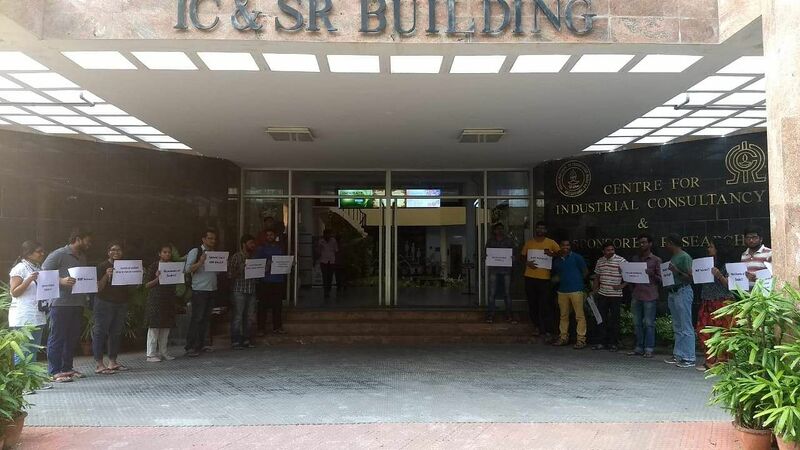 "Students and faculty at IIT Madras registered their protest today (Feb 5, 2019), against inviting Dr B M Hegde to address the audience at IIT Madras. Mr Hegde, who has been a very vocal proponent of pseudo-science not only failed to entertain rational questioning but also rejected the theory of evolution. He also said that a cut-off finger can grow back on its own like a salamander tail and that he has witnessed it himself. He said he would never prescribe psychiatric drugs himself. Rejecting the WHO report about the leading causes of mortality across the world, he said that the side effects of medicine is the major cause of death. He, however, failed to quote any source for the said claim. He proved once again that he is indeed a 'merchant of doubt', who dissuades people from seeking medical help," the group said in a statement on Tuesday condemning the move by Saathi, who invited Hegde for the lecture. "Hedge has thrashed modern medicine, said he believes in quantum healing, homeo in several of his articles and TED talks. All these things have no concept of science relating to it. On Saturday we emailed the Dean of Students, faculty advisor and the core team of Saathi and in that mail, we attached a video where Hegde is making all these dubious claims. We also sent a list of his published articles and the rebuttals to it. In the mail, we said that our institute has recently witnessed an increased number of suicides. In this situation, it is completely unacceptable that, instead of creating scientific awareness about mental health, Saathi sends out a mail stating that we could find 'the secret sauce of happiness', by listening to his talk. Saathi is a body that has been set up to remove the stigma around mental health, instead of addressing that problem they were hosting this event and we thought it would send out a wrong message. 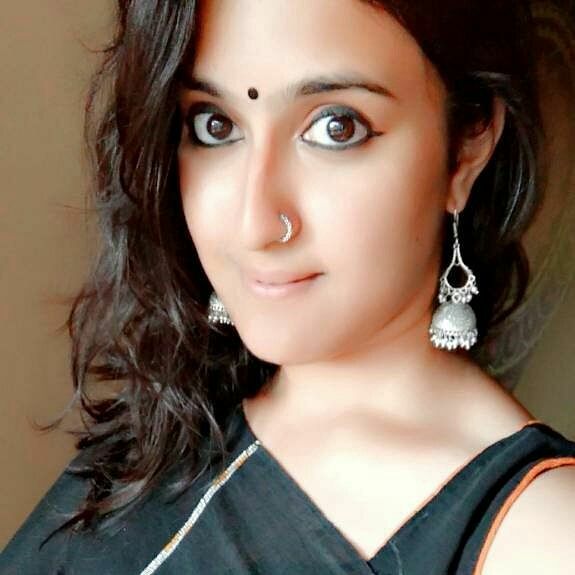 It is actually very insensitive," Aparna said. She added that their emails were overlooked and the event took place anyway. "At least 10-15 students had emailed, we didn't get a response and they went ahead with the programme. On the day of the event, we staged a protest IC & SR building. Some of us went inside the hall to ask Hegde some questions. One of his TED talks in 2013 actually says that the heart can heal by itself and you need not go to a doctor, cells can readjust themselves. When we asked for proof and said if there are scientific publications or journals, he said it's been there for centuries. Some other students asked him about evolution and he said that he was there for a motivational speech," adds Aparna. When contacted, the organisers of the event (Saathi) refused to comment on the incident. Reacting to the protest, Hegde told PTI that it only indicates how much the protesters know about science.